Patty Forming Machines - Tomahawk Manufacturing, Inc. - Tomahawk Mfg. The Tomahawk Line of patty forming machines brings several advantages over the competition. Patty forming machine speed comes in a couple different valuable forms. Lets start with quicker lead times, depending on your configuration we can get you a patty forming mahcine as fast as six weeks. Once the machine is in place and running, you get the benefit of high speed patty forming. Take for example our high end Tomahawk TM-1000 Patty Forming Machine: it operates consistently and reliably up to 90 strokes per minute (read more in our TM-1000 Product Brochure - PDF). Even chaning speed is "speedy": when you adjust speed, the machine moves to the new setting without the delay or waste that occours in traditional formers. Tomahawk offers all off the shelf Allen Bradley components. This protects your investement by assuring you always have access to replacement components. Have piece of mind your patty forming machine will be easy to repair in the event something does fail. Superior construction, available parts: With all off the shelf Allen Bradley controls, NEMA style doors, reinforced frames, and stainless steel tank coming standard, there’s no need to upgrade; we are your patty forming machine upgrade. The efficiency of your patty forming machine is critical to the cost effective long-term operation. Tomahawk thought about every aspect of your patty forming operation and implemented and patented technologies to raise the ba on efficiency. 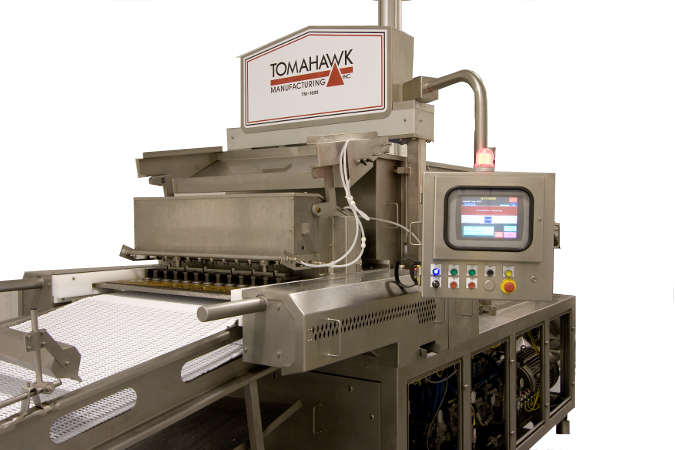 Tomahawk's patented Shutter Technology provides an efficient design that optimizes product formation quality. By replacing the tube valve with the flat shutter plate, maintenance and operational cost are dramatically reduced. When a problem develops in the patty forming machine, a message appears on the operator panel describing the problem. This is a text message, not code that operators may not understand, and have to look up. We have implemented several technologies and features that will make changeover a breeze. Program Pause Technology - Patented Program Pause technology, with constant fill cycle design, eliminates product waste during setup and speed changes. The TM-1000 adjust to the speed you want with the same stroke speed each time; simply dial a number into the operator control panel. Recipe Recall allows fast recovery of setup conditions for previous orders, saving up to 15 minutes each changeover. Enter a recipe for a previous job that you will be running again, and the machine restores the exact settings. Clean Up Friendly. Access for clean-up is easy. Each and every wash down can be accomplished quickly and efficiently, saving time every changeover. With Tomahawk's 40" (1M) wide forming platform, productivity is greatly increased over narrower machines. Plus, Tomahwk engineers have incorportated exciting technological improvements that allow you to EXPECT MORE form you forming machine investment and operations. The TM-26 is our most popular forming machine... ...and for good reason. Built with our "Listen. Improve. Serve" philosophy, the TM-26 is engineered from the ground up with client needs in mind. Combine this with our ambition to build the highest-quality machinery in the market and you have the TM-26 that out performs and out lasts the competition. Like the TM-26, the TM-19 comes equipped with a heavy duty reinforced frame and all NEMA style doors with heavy duty cam locks. It doesn’t stop there; come and take a deeper look into the Tomahawk lineup to see what has formed us into the leader of innovative ideas and products. Call us at 920-458-8008 to talk with a sales representitive soon! Be sure to mention you found us on the internet. Thanks!